Whether you’re a young professional, a busy stay-at-home parent, or an active teenager, we all want to feel confident about our smile. Sometimes, however, we need a little help fixing impairments like crooked teeth, gaps, or overcrowding. The two main methods for fixing these issues are Invisalign and braces. Braces are constructed from colored metal or resin brackets and are attached to the face of your teeth. Invisalign is computer-generated and custom-made for your teeth. It’s composed of removable, clear trays that are virtually invisible. Both are great options, but how do you know which one is right for you and your family? To help you choose, we put together this brief guide. 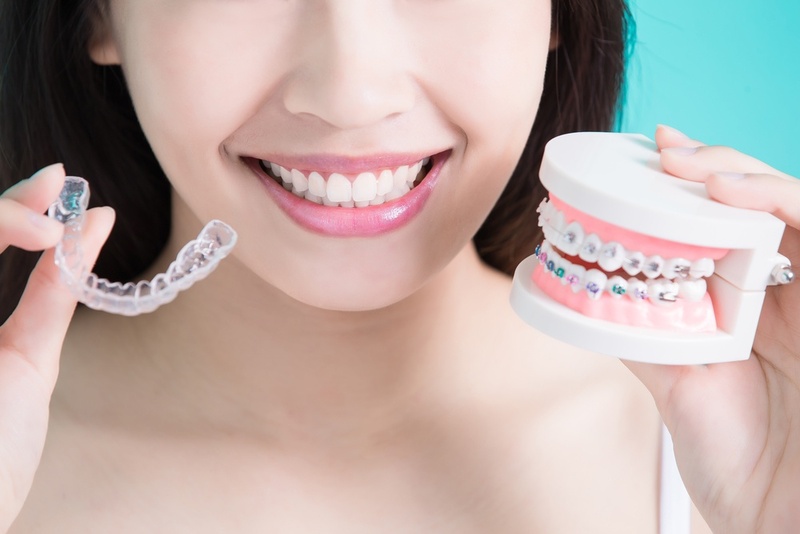 Here are 4 things to keep in mind when choosing between Invisalign and braces. Braces are attached directly to the face of your teeth and worn permanently for an average of 2 years. Since they cannot be removed, they work around the clock to help you achieve the perfect smile. Invisalign treatment usually only lasts between 9-15 months. However, since Invisalign is temporary, there’s always the temptation to remove the aligners. And, if you remove them too often, you can erase any progress you’ve made. We’ve already mentioned that braces are attached directly to your teeth and worn permanently. Because of this, dental braces also work faster than Invisalign to close gaps or straighten teeth. They’re the perfect solution for fixing overcrowded or crooked teeth! However, if you’re simply looking to straighten your teeth without the long-term commitment to braces, then Invisalign is perfect for you! With traditional braces, you can choose the color of your braces to make a fashion statement. Invisalignis virtually invisible, meaning Invisalign wearers can smile more confidently in social situations than they might wearing braces! Invisalign also feels more comfortable than traditional braces. Braces tend to irritate and chafe the inside of your mouth. With Invisalign, there are no wires or brackets rubbing against the inside of your mouth. Traditional braces require fewer trips to the dentist, saving you time and gas money! However, cleaning braces takes more time than Invisalign, as Invisalign features trays you can remove and wash.
Invisalign is a great option for any athlete. If your child wears braces and gets hit in the face with a ball, the brackets could cut their lip or cheek. Also, while braces can sometimes give you a slight lisp, Invisalign doesn’t affect your speech. What’s also nice about Invisalign is that you can eat food you can’t with braces. When you have braces, you can’t chew gum or enjoy any of these yummy foods: sticky candy, hard candy, nuts, popcorn, corn on the cob, and the list goes on. With Invisalign, these food restrictions don’t apply. You can easily remove the trays and enjoy all of the above goodies! If you’re still unsure about which is right for you and your family, you can always ask your family dentistfor advice. 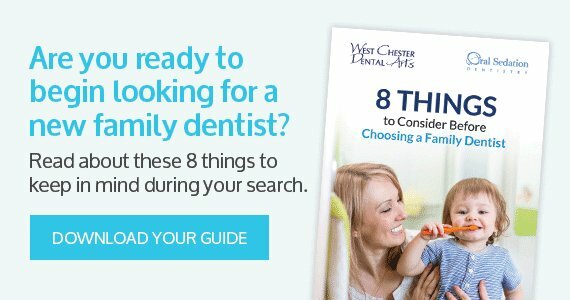 At West Chester Dental Arts, we can offer guidance and expert recommendations to help you achieve the best version of your smile. Give us a call at 610-696-3371 to schedule your appointment today!